Penn State Football: Did the Punishment Fit the Crime? The NCAA came down extremely hard on the Penn State football program today by levying a $60 million sanction (the equivalent of one year’s football revenues), a 4-year bowl ban, a drastic reduction of scholarships (from 85 to 65), in addition to vacating every win dating back to 1998. The announcement was made just one day after Penn State voluntarily removed the Joe Paterno statue from the front of Beaver Stadium. 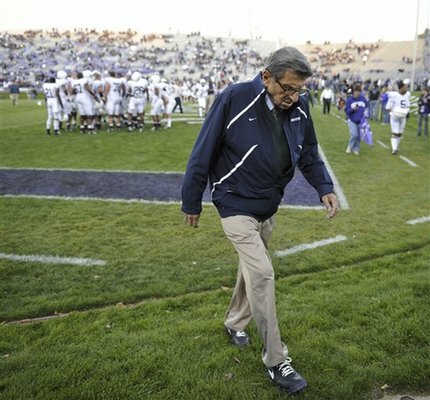 As a result of the vacated wins, Paterno is no longer officially the winningest coach in college football history, but that is of little significance in the scheme of things. The program that Paterno built may never again be considered one of the elite in college football, and the university has only itself to blame for shamefully covering up the vile crimes and abhorrent behavior of Jerry Sandusky in an effort to avoid tarnishing the Penn State football brand. Yet somehow, many people still love Paterno in spite of his despicable decision to help cover-up Sandusky’s crimes. Even the most diehard fans realize that football is just a game, not a matter of life and death. Sadly, that fact was lost on all of those in the Penn State administration who placed a higher value on football than it did on the protection of innocent children whose lives have been forever altered by their selfish decisions. Did the punishment levied against Penn State football today fit the crime? Absolutely! However, like all NCAA punishments, there will be collateral damage to people who had nothing to do with the crimes committed or with the cover-up that happened for several years afterwards. There is no sadness or anger as great as that of Sandusky’s victims and their parents. Their lives will never be the same. Any good parent should also be saddened and disgusted about what transpired at Penn State, even those parents of the current players who are being severely punished for something that was beyond their control. While Paterno is looked at as a deity amongst many Penn State students and alumni, no one should feel sorry that his legacy is forever tainted. No one should lose any sleep over the fact that he is no longer listed in the record books as the winningest coach in college football history. And no one should bemoan the fact that his statue was taken down because it had become a source of great controversy. The student athletes who are being punished by the sanctions levied against Penn State today are the only ones who deserve any sympathy, because they are being victimized as they pay for the sins of high-powered grown-ups who could have, and should have, put a stop to Sandusky’s heinous acts. An honest answer to that question will leave little doubt that the punishment absolutely fit the crime!